Scripture: Matthew 28:1-9 1After the Sabbath, at dawn on the first day of the week, Mary Magdalene and the other Mary went to look at the tomb 2 There was a violent earthquake, for an angel of the Lord came down from heaven and, going to the tomb, rolled back the stone and sat on it. 3 His appearance was like lightning, and his clothes were white as snow. 4 The guards were so afraid of him that they shook and became like dead men. 5 The angel said to the women, “Do not be afraid, for I know that you are looking for Jesus, who was crucified. 6 He is not here; he has risen, just as he said. Come and see the place where he lay. 7 Then go quickly and tell his disciples: ‘He has risen from the dead and is going ahead of you into Galilee. There you will see him.’ Now I have told you.” 8 So the women hurried away from the tomb, afraid yet filled with joy, and ran to tell his disciples. 9 Suddenly Jesus met them. “Greetings,” he said. They came to him, clasped his feet and worshiped him. Devotional: Tomorrow we celebrate the resurrection of Jesus Christ. There is no greater moment than this for those who follow Jesus, for without the resurrection, there is no victory over sin and death. Simply put, there is no Christianity without the resurrection. Don’t overlook the significance of this event. Jesus’ death and resurrection changed the world. And it provided for you and me to receive life, though we deserve death, A beautiful, abundant, and blessed life. Eternal life. Give thanks for that today. 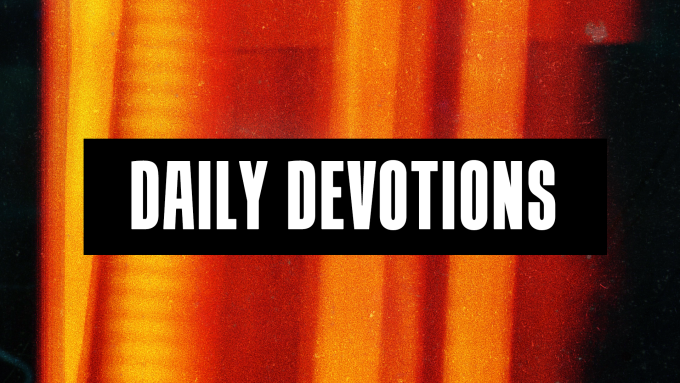 Devotional: This past week during Sunday’s message, we talked about the two criminals who hung alongside Jesus on the cross. The unrepentant criminal was prideful, critical, entitled, had no fear of God and seemingly no need for a Savior. The repentant criminal feared God and was broken, humbled, desperate and in need of forgiveness. Both criminals deserved death, but only one received eternal life. Why? Because he recognized Jesus for who He was, the Son of God. You may not be a criminal, but Scripture tells us that “all have sinned and fall short of the glory of God” (Romans 3:23) and the “wages of sin is death, but the gift of God is eternal life in Christ Jesus.”(Romans 6:23). Because of your sin, you deserve death, but because of what Jesus did, you can instead receive life. But that takes repentance. Have you humbled yourself before God and sought His forgiveness? Have you recognized Him for who He is and acknowledged His sacrifice on your behalf? If not, what is preventing you from doing that right now? If you have, who do you know who desperately needs to hear this truth? Take some time to pray – either in repentance for your own prideful ways, or for someone you know who is in need of a Savior.